To view reports, go to the main Channel tab > Stats subtab. 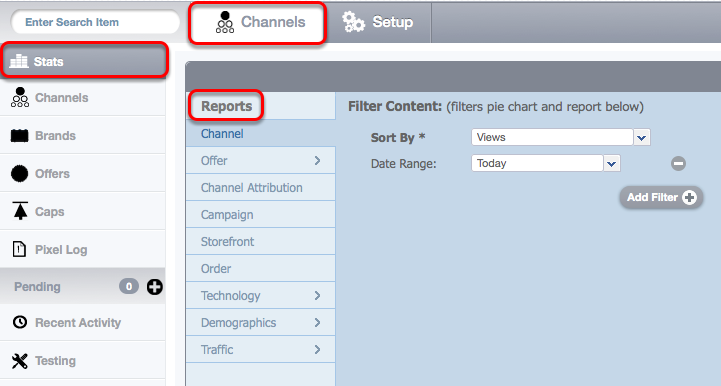 Channel reporting allows you to see where your traffic is coming from by drilling down into each specific channel. Using the filter options at the top allows you to drill down further into the report. To the right is a simple pie chart that shows traffic for your various channels. Below, you will see a full report of every channel. You can drill down further into the lower report by clicking on one of the icons to the left of the channel. You will learn more about the drill down icons later in this document. Offer reporting allows you to view offer-specific traffic and see how each offer is performing across all channels. Using the filter options at the top allows you to drill down further into the report. To the right is a simple pie chart that shows traffic for your various offers. Below, you will see a full report of every offer, and have the ability to drill down further into the lower report by clicking on one of the icons to the left of the channel. You will learn more about the drill down icons later in this document. Channel Attribution allows you to view the path of your traffic across channels. Just like all other reports, you have the ability to filter data on the top, however, you will see a new visual of a sankey to the right. The sankey visual shows you the path that the user went through from the original click through to final conversion. If you hover over the lines, the specific paths darken, giving you better visibility. You can further drill down by selecting a specific channel, which changes the view to a sunburst. The sunburst sends you through the user's journey again, starting at the middle circle moving out to the final conversion. For example, in the sunburst view above, you see the user first clicked from an affiliate link, then saw/clicked on a display ad, and finally went back to an affiliate link which is where the final conversion took place. A legend displays to the right that explains the sunburst diagram. 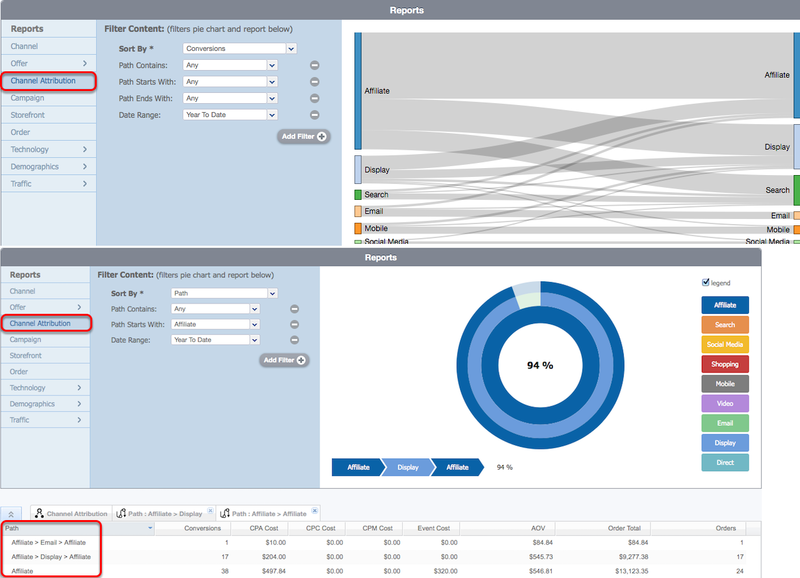 The report at the bottom allows you to drill down into the attribution path as well, which gives you full visibility into your multi-channel attribution. Campaign reporting allows you to view traffic down to the most granular level, which is a campaign. Campaigns are the 1 to 1 relationship between the specific traffic source and the offer to which they are driving traffic. Campaign reporting also shows every campaign's performance across all channels. Using the filter options at the top allows you to drill down further into the report. To the right is a simple pie chart that shows traffic for your various campaigns. Below you will see a full report of every campaign and have the ability to drill down further into the lower report by clicking on one of the icons to the left of the campaign. You will learn more about the drill down icons later in this document. 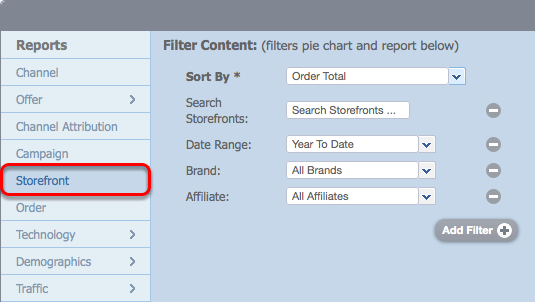 Storefront reporting allows you to view your traffic based on CAKE's ecommerce functionality. This means you can view traffic down to the SKU level for your products. Storefront reporting also shows specific details about every sale, including order totals, line item pricing, SKU codes and more. Using the filter options at the top allows you to drill down further into the report. To the right is a simple pie chart that shows your storefront's traffic. Below you will see a full report of every storefront, and have the ability to drill down further into the lower report by clicking on one of the icons to the left of the storefront You will learn more about the drill down icons later in this document. Order reporting shows you all orders as individual line items and allows you to view information based on each of the orders. Using the filter options at the top allows you to drill down further into the report. To the right is a simple pie chart that shows your orders. Below, you will see a full report of every order. Within the technology report, you will have a set of specific drill down options. These options are: ISP/Carrier Group, ISP/Carrier, Operating System, Device, Browser, Referrer and Search Terms. You can select any of those options to view reports for the technology selected. Using the filter options at the top allows you to drill down further into the report. To the right is a simple pie chart that shows your various technologies. Below, you will see a full report of every technology. Within the demographics report, you will have two drill down options - Country and Language. You can select any of those options to view reports for the demographic selected. 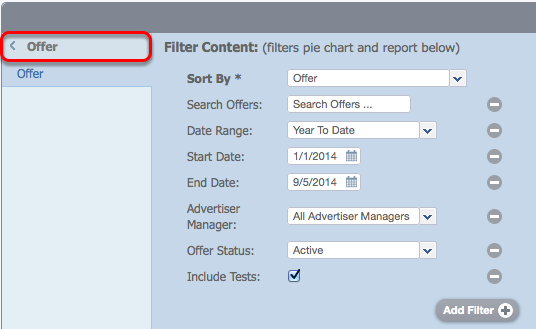 Using the filter options at the top will allow you to drill down further into the report. To the right is a simple pie chart that shows your demographics. Below, you will see a full report of every demographic. Within the traffic report, you will have a few specific drill down options - Daily Traffic, Clicks and Conversions. You can select any of those options to view reports based on clicks/conversions. Using the filter options at the top allows you to drill down further into the report. 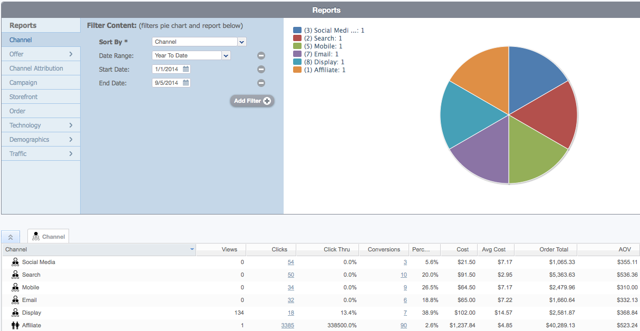 To the right is a simple pie chart that shows your clicks and conversions. Below, you will see a full report of every click or conversion generated within your system. Most of your reports will include drill down icons that allow you to view more granular and specific data. Hovering over the icon will show you what the icon stands for. Once you get more comfortable in the system, you will be able to tell what the icon stands for right away. Clicking on the icon will open another tab within your same report, which gives you the ability to quickly and easily jump from report to report. To close out the tab, simply click the "x" on the right side of the tab.